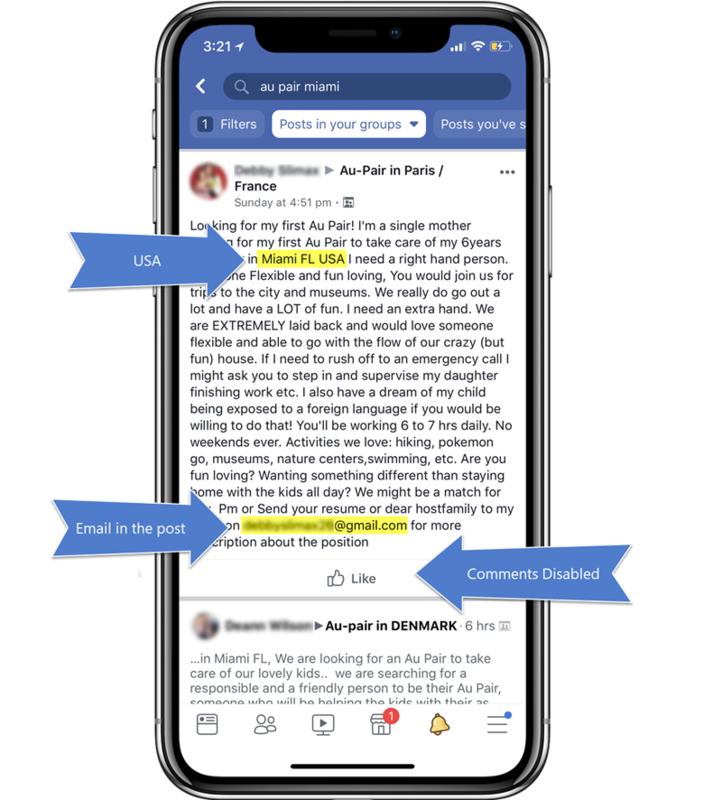 I've noticed so many scammers on the Au Pair Facebook groups and decided to dedicate a post to explain how the scam works, how to spot a scammer post and what you should do when you see one. 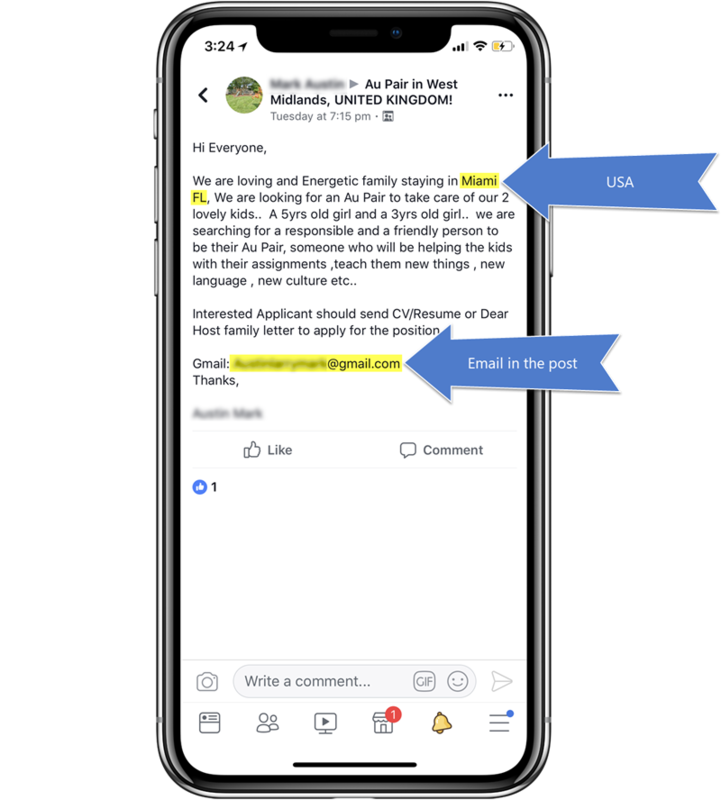 ​They put a post on a Facebook group looking for an Au Pair. Usually, they say they are a family in the US (sometimes UK), in a city like Miami Florida. It looks like a normal post but at the end they add their email address and ask for a resume or dear host family letter. Sometimes comments are disabled on the post to stop people from calling them out. The profile that posted also looks normal, they have a few photos of a happy family and their locations is set to somewhere in the US like Miami Beach, Florida. When you email them that's the start of the scam and everything from that point will be done over email (see example below). Tell you about the great pocket money ($850 USD per week), free flights, amazing accommodation, etc. Still not sure if its a scam? Check their Facebook profile. Does it look suspicious? Check who liked their pictures... if most of the likes are from suspicious countries it is a scam. Do not communicate with them!!! Di**** is 7years old and Pa****** is 4 years , they both love going out to places like beach, parks ,Going to cinemas, and swimming etc , , I'm sure you would have seen most of the activities they love doing on Facebook . You will be working 6 to 7 hrs daily , 5days in a week , Saturdays and Sundays will be your off days and we will be paying you weekly wages of $850, we will also give you a car that you will be using while during your stay as an Au pair with us . -16:45 Host mum arrive back from work. Are you a member of any Au Pair agency ? Are you available to switch your Agency if my family seems to be your perfect match?? Are you financially ready for your documentation program ? Did you believe that you can provide all the requirements needed to start your j1Visa process ? Are your family aware that you are looking to be an Au Pair in USA ? We will direct you to one of the Agent Au Pair Coordinator known as Mary Pates, she will be the LCC in charge of your documentation process , she will tell you the list of requirements that you need to provide , How to make payment , She will also send the forms needed to fill as an Au pair and the total pay cost for the program is $1650. Let us know if everything is suitable for you so that we will be able to direct you to Sarah Wolf regarding the Visa Process.